Whole Foods put my beloved sushi grade ahi tuna on sale for a decent price, and it was fresh and local making it all the better, so I wanted to do something fun with it. I had picked up a used copy of Bread Tomato Garlic, by Jill Dupleix, (a favorite chef of mine). It is a book full of quick cooking recipes, each with 3 main ingredients and I found this recipe using tuna, soba noodles and avocado. It sounded like a simple and perfect summer dinner. Roll the tuna in the salt, pepper and sansho pepper. Heat the vegetable oil in a non-stick frying pan until quite hot and sear the the tuna for 30 seconds on each side. Remove from the heat and let rest for 30 minutes. Cook the soba noodles in a large pot of water for 6-8 minutes or according to the instructions on the package, until cooked but still firm, as for spaghetti. drain well, rinse under cold running water and set aside. Mix the mirin, soy sauce, vinegar and sesame oil in a large bowl, add the drained noodles and toss well. Cut the avocado in half lengthwise and twist the two halves apart. Hit the pit with the blade of a large knife, then turn the knife to twist out the pit. Peel off the skin and cut the flesh into small cubes and toss lightly through the noodles. Arrange the noodles in mounds on four small dinner plates. Thinly slice the tuna and arrange 3 or 4 slices on top. Drizzle with a little extra sesame oil and serve. Dupleix notes: "Sashimi-grade tuna is super-fresh and trimmed in neat blocks ready for cutting. It is available from specialty food shops, top-quality fish shops and Japanese food stores." Notes/Results: Delicious! The cold soba noodles and creamy avocado are a perfect match for the tangy, lightly spicy ahi. In addition to the local fish, I used the avocado and some green onion from my CSA box. I made a couple of changes, mixing in some black and toasted sesame seeds into the coating, adding a touch of lime juice to the dressing an garnishing with sesame seeds and chopped green onion for some color. I thought I had sansho pepper (actually a spice rather than a pepper), but found out it was shichimi, (a chili pepper blend with "seven flavors") in my pantry. Since shichimi is spicier than sansho, I thought using a little less and mixing the sesame seeds into the coating would make it the right spice level for me, and it did; spicy but not "burn your mouth hot". A great, healthy dinner for a warm night and a keeper recipe, that I will try with the sansho pepper at some point too. I am sending this one to Presto Pasta Nights, being hosted this week by the wonderful Joanne at Eats Well with Others. Check out the PPN round-up on her site on Friday for lots of amazing pasta dishes. Don't forget to enter my giveaway of a "Sweet Treats" prize package from the new Betty Crocker Gluten Free Dessert Mixes. Get all the details for entering here. That looks out of this world good. I had my first sushi grade tuna a few weeks ago and I am hooked. I don't have the seven spice blend, but I do have the sichuan peppercorn (whole). Great pasta for Joanne's round-up. I shall join you tomorrow. Thanks for the submission, chica! It looks so great. Kudos to Whole Foods for actually putting some good local food on sale. That cookbook sounds really useful. Sometimes you just want something with a few main ingredients rather than thirty-five. You always have the most colorful plates : ) Looks beautiful and very impressive. Yum, can I come over for lunch? This looks soooo good (but nobody in my house would eat it but me)! This is a beautiful meal. You get more creative with each passing day. I should try the ahi/avocado combo with soba, it sounds perfect for lunch or dinner! Beautiful looking dish. 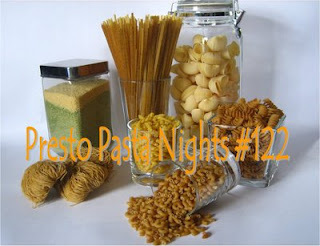 Thanks so much for sharing with Presto Pasta Nights. It's always a pleasure when you do. wow, lovely addition with the avocado! I love how it becomes sort of a buttery creamy sauce for the noodles!